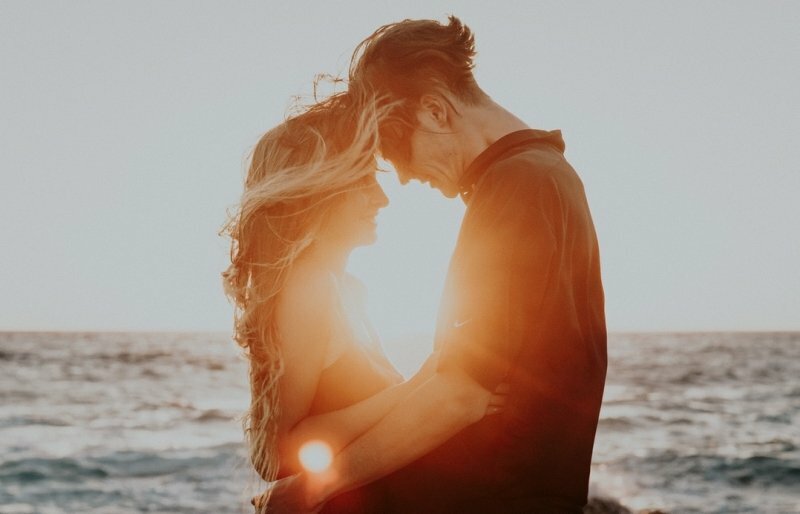 Fall in love with your partner all over again at these places. Move over, Maldives and so long, Santorini. 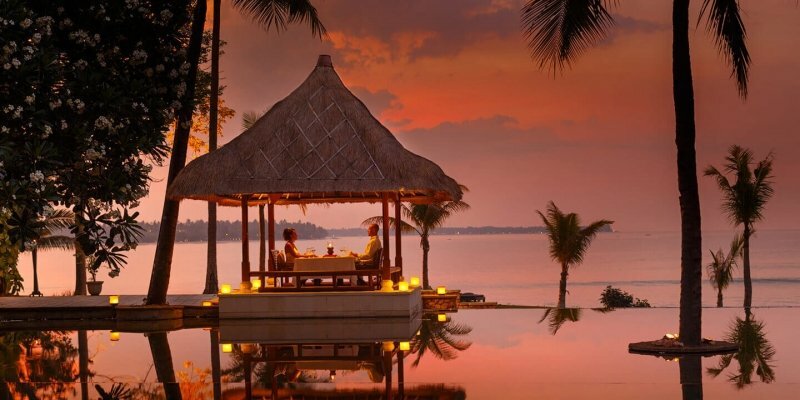 Southeast Asia is home to some of THE most exotic honeymoon destinations on the planet. Gorgeous islands, pristine beaches, stunning villas and magnificent views are aplenty! There’s simply no excuse to not have an exciting honeymoon with your other half. A honeymoon is a special milestone in a relationship and it should be nothing short of blissful and perfect. This specially curated list of seven spots will assure you a memorable honeymoon chock-full of romantic moments. With a myriad of bucket list-worthy destinations to pick from, there is something for every type of couple, from embracing adventure outdoors and canoodling by the beach to simply cuddling in the comforts of your own honeymoon suite. Read on, lovebirds, and be prepared to swoon in delight! 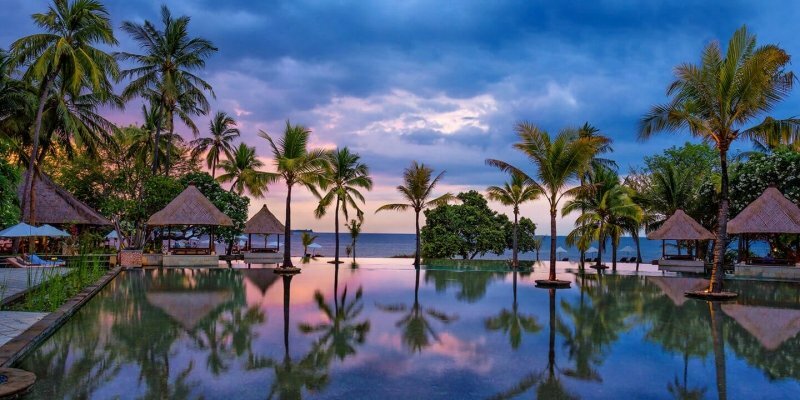 Bali has been a mainstay in countless honeymoon destination recommendations for a long time, and for obvious reasons. From traditional temples, to the iconic rice terraces and serene beaches, Bali exudes endless romance and charm. For the more adventurous honeymoon couple, it offers exciting activities such as watersports, volcano trekking and even horse riding! This paradisiacal destination is almost everything a newly-wed couple could ask for! Samabe Suites and Villas is an all-inclusive resort in the Nusa Dua area which screams glamour and tranquillity. They have 81 fully-furnished suites and private villas that are tastefully designed and infused with Balinese elements for that authentic touch. 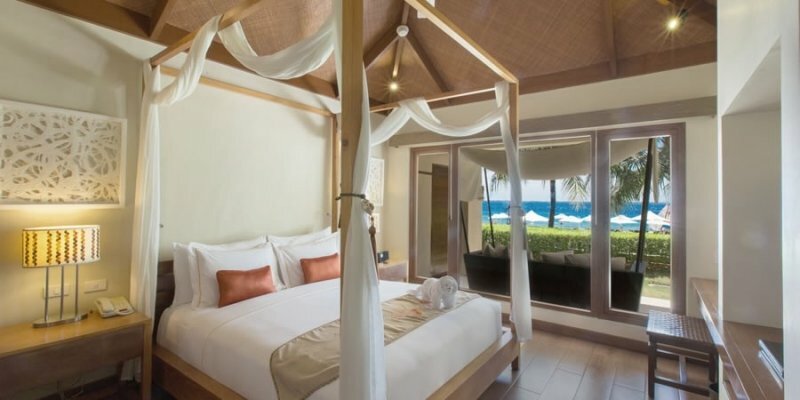 For the best honeymoon experience, book their swanky Ocean Front Honeymoon Suite! The bed and bath directly face the serene sea and azure skies, teleporting you to your own fantasy land. Nothing defines romance quite as perfectly as this. Looking to spend some intimate moments together by the pool? Get an upgrade to the Pool Suite or One Bedroom Ocean Pool Villa! The clifftop location of this hotel offers mesmerising, unblocked views of the sea that you can enjoy in ultimate privacy. What’s more, for guests celebrating their honeymoon, receive a sweet token of appreciation, ranging from a bouquet of flowers or even a cake! Already planning to spend your honeymoon with Samabe Bali Suites and Villas? Well, take advantage of their Romantic Retreat Package! Aptly named, the ‘Just Two of Us in Paradise’ offer is specially curated for a memorable and blissful experience with some exclusive perks! AND SO MUCH MORE! It’s a great deal not to be missed! Read TripZilla’s hotel review here and to visit Samabe Bali’s website, click here! You will also never get bored at Samabe Suites! Catering to different interests, Samabe’s Signature Activities will certainly keep you entertained. Go on a kayaking or scuba-diving exhibition along Bali’s picturesque coast, or try your hand at preparing some local dishes at Samabe’s very own cooking classes! Click here to see other exciting activities that await you at Samabe! A ritzy establishment in the heart of chic Seminyak, The Legian Bali is a grand escape exuding beachfront opulence. It boasts a three-tiered infinity pool which will entice you to snooze by the poolside with stunning Indian Ocean views all day. With its traditional Balinese-infused furnishings and touches, you’ll immediately feel the warmth and hospitality of Indonesia! Part of The Legian, The Club features extravagant pool villas that are posh and stylish. As you enter your private villa, be greeted by a gorgeous 10-metre pool. Unwind at the exclusive grand pavilion that doubles as a spot for you to dine and relax in the company of one another. This divine sanctuary prides itself in its first-class standards of service and 24/7 butler service! You’re surely already convinced to pack your bags and head to The Legian. While you’re at it, why not check out The Legian Bali’s Villa Escape promotion! Stay two nights or more and save 20% off flexible rates and a myriad of Club benefits when you book the One Bedroom Villa at The Club at The Legian Bali! This special offer, which is only valid till 31 July 2018, includes: daily in-villa breakfast, dedicated butler at your service, complimentary morning yoga, afternoon tea and free-flow mini bar, daily sunset cocktails and private return airport transfer. And the list goes on! Check out the full details here and get the most bang for your buck for that luxe honeymoon you so crave! Read TripZilla’s hotel review here and to visit The Legian’s website, click here! Located in Northwest Bali on Menjangan Island, Menjangan Dynasty is a gem waiting to be discovered. They pride themselves in their unique concept of ‘Glamping” – Glamorous Camping! Escape your fast-paced city life and rendezvous with nature. The resort features distinctive safari-style tented rooms and villas as well as a gorgeous cliff-edge infinity pool. For a surreal honeymoon experience, be sure to book their Beach Camp Tent! Surrounded by a dramatic seaside landscape and lush greenery, this accommodation type offers a unique ‘monsoon shower’ and an alfresco area furnished with loungers and daybeds. Embrace a whole new definition of the words ‘luxury’ and ‘exotic’ on your honeymoon escape to Menjangan Dynasty Resort. Menjangan Dynasty is now offering a special 3D2N Honeymoon package for you to kickstart a lifetime of marital bliss! This exclusive promotion, starting from $412.50, includes: 2-night stay in a Beach Camp Tent, daily breakfast, a bottle of wine upon arrival, candlelight dinner for two, 120 Minutes Spa for two, afternoon tea and honeymoon souvenir. Check out this great deal and enjoy a unique and memorable honeymoon experience. Read TripZilla’s hotel review here and to visit Menjangan Dynasty Resort’s website, click here! Often overlooked by its sister island Bali, Lombok is just as blissful and beach-blessed and definitely deserves more attention. Lombok has mind-blowingly pristine beaches and impossibly clear waters great for diving too! If you and your partner are adventure junkies, Lombok is the perfect destination for you. Gunung Rinjani dominates Lombok’s topography and draws mountain climbers and trekkers from all over the world. Steal a passionate kiss with your beloved against the backdrop of the jaw dropping sunrises atop the summit! You’re definitely in for a restorative and invigorating honeymoon experience. This idyllic five-star haven exceeds all standards of luxury ever imaginable! 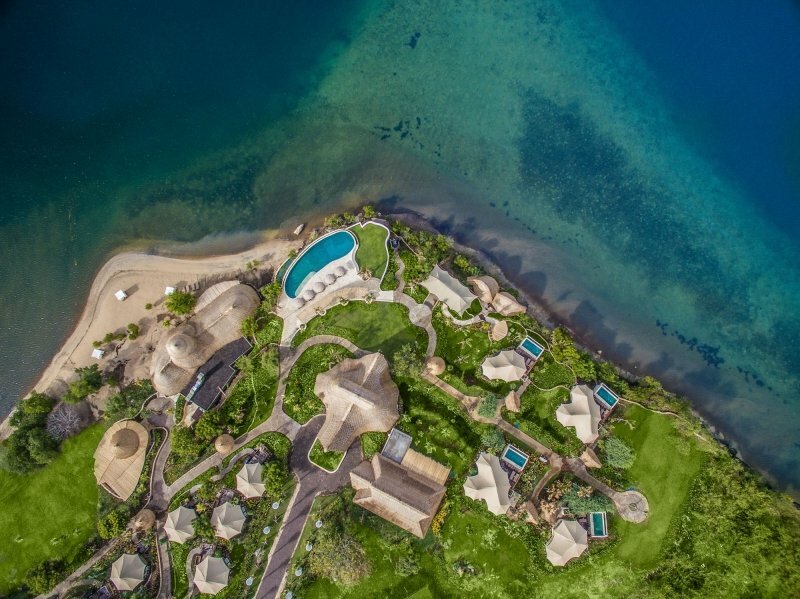 Located on the gorgeous Medana Bay, it boasts exclusive beach access and enchanting views of Mount Agung. The Oberoi spans over a staggering 24 acres of carefully manicured gardens, towering native trees and... a stunning infinity pool! The resort’s accommodation options are divided between thatched villas and pavilions, all of which have ocean and garden views. Their Ocean Villas with Private Pool are to die for! As you enter your private abode, be greeted by a private courtyard featuring your own pool, and retreat with your lover to the king-sized canopied bed! Fall deeper in love with your partner at this romantic and picturesque seafront resort! 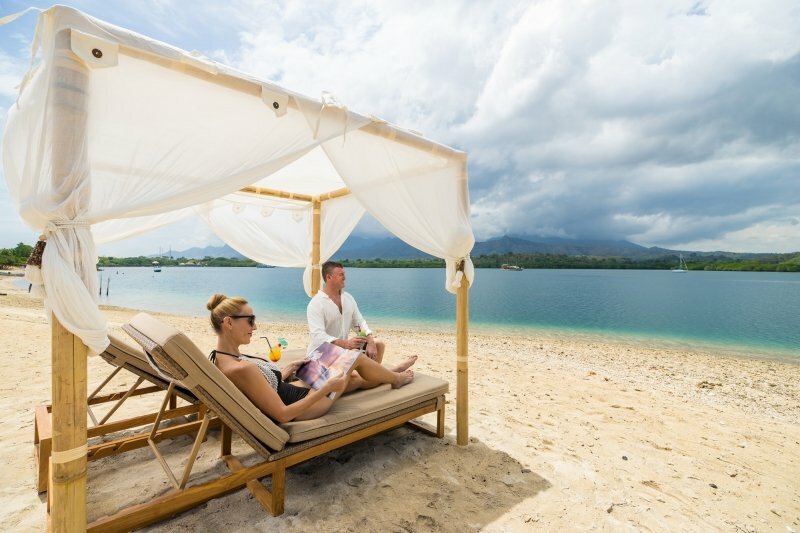 Take a leap into paradise on earth with an Exotic Escape package deal at The Oberoi Lombok when you book a minimum of three nights stay! As part of this promotion, The Oberoi is offering special rates for their packages starting at IDR 9,658,500 for a Luxury Villa and IDR 13,426,000 for a Luxury Ocean Villa with a Private Pool! The prices include: 3N minimum luxury accommodation for two, daily breakfast, three-course dinner in hotel restaurant, complimentary use of gymnasium, tennis court and business centre, daily afternoon tea and return airport transfer. Check out this great deal and revel in all things fine and exquisite! To visit The Oberoi Lombok’s website, click here! The Oberoi also offers a diverse variety of activities for you to make your romantic honeymoon an exciting and revitalising one! Accompanied by a member of 'The Oberoi Beach Club' team, book and enjoy a snorkelling trip around unspoilt coral reefs teeming with marine life and majestic sea turtles. The establishment also features open air dining spaces for you to have a romantic candlelit dinner with your beau. What’s more, enjoy a relaxing couples’ spa session at their very own Oberoi Spa! Check out the full range of The Oberoi Experiences here! This province in Central Luzon is largely associated with significant events in the Philippines’ history, namely the Bataan Death March and the Fall of Bataan. However, that is not all that it is known for! 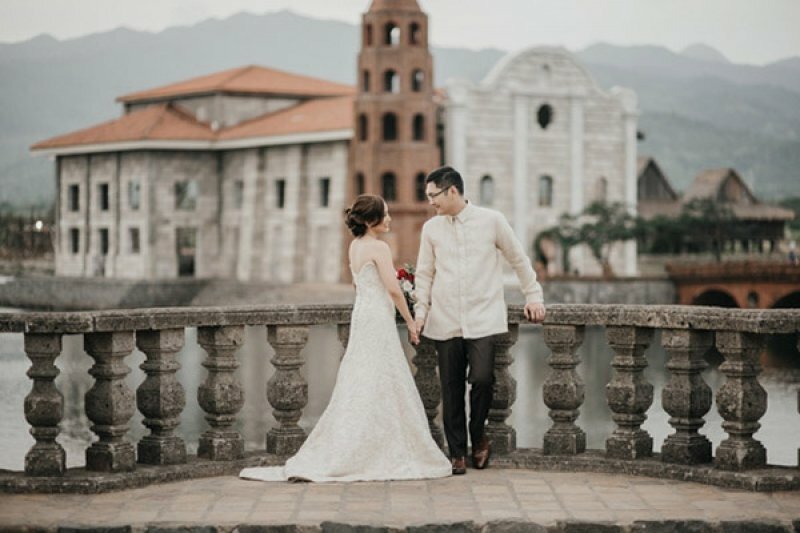 Accessible from Manila by land, Bataan is a promising honeymoon destination not only for history enthusiasts, but for those who just love nature, beaches and and the outdoors in general. 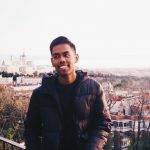 It used to be a highly underrated destination before, but now is proving to be a hidden gem instead! Las Casas Filipinas de Azucar will take you back to the Spanish colonial era. Doubling up as a heritage and convention centre, it exudes a historic ambience and old-world charm, with each room boasting Spanish-Filipino culture with modern amenities. Take in the alluring colonial sights as you stroll hand-in-hand with your partner while discussing all things under the sun. If you’re feeling fancy and would like to splurge on your own private abode, you may consider the private villas. Namely Casa Bonita, Casa Esquina and Casa Terrazza, these standalone studio set-ups feature beautiful Spanish motifs that are swoon-worthy. They offer king-sized beds, and the architectural details and intricate furnishings will leave you absolutely speechless. Oh, and the dramatic bathtub set-up will make you not want to even leave the room! 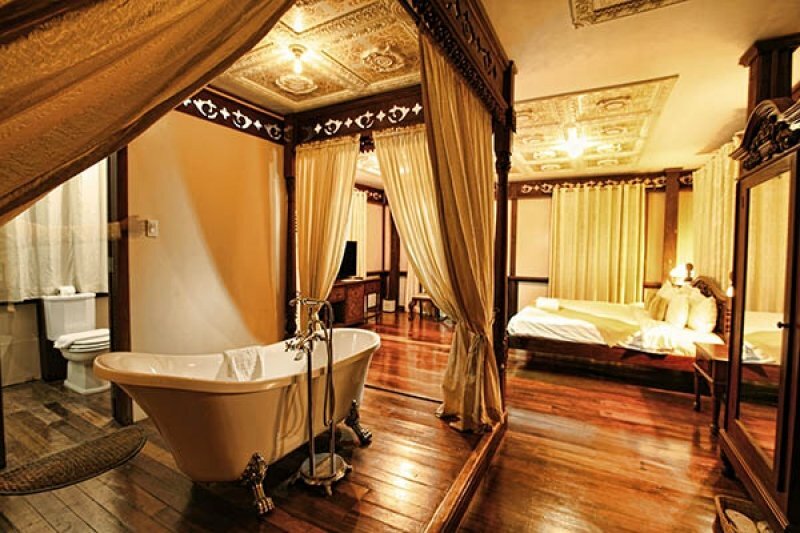 Reminisce your courtship days at Las Casas, an establishment which is literally a blast from the past! With their exclusive Stay A While Couple Package, you will definitely be wishing to stay FOREVER instead! For just a limited period of April 2018, book a Deluxe room for a minimum of 2 nights to gain access to unbeatable prices, starting from PHP 18,548! This irresistible deal include: 2-night accommodation for two, daily breakfast, lunch and dinner, night river tour, heritage walking tour and workshop tour, Hop On Hop Off Jeepney and Tramvia Rides and return transfers to Balanga. Check out this great deal and have a historical and enchanting honeymoon like no other. Las Casas has also a myriad of other offers to suit your needs, so be sure to browse their offer page to see what fits best. There are several Early Bird offers that certainly should not be missed! 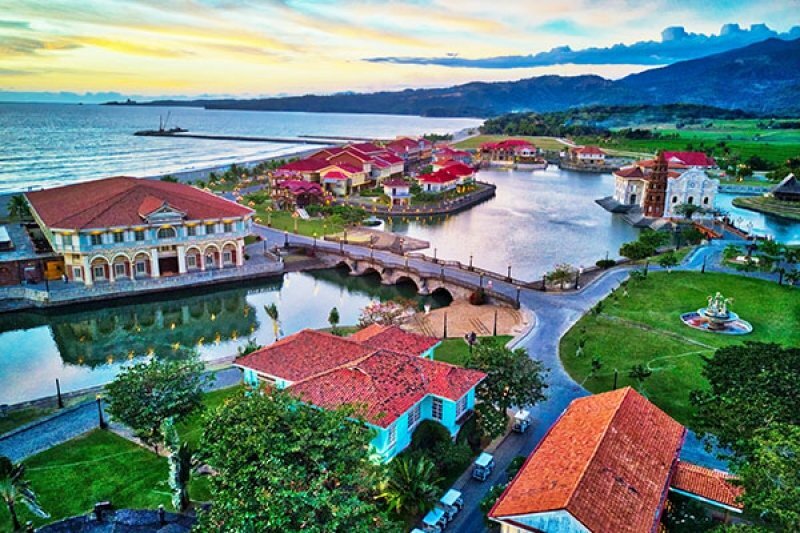 To visit Las Casas Filipinas de Acuzar, click here! Although still considered an off-the-beaten path honeymoon destination, the Philippines is a collection of islands that screams romance! Cebu is well known for its white-sand beaches and spectacular diving and water sports opportunities. Being a coral island, Mactan is truly a paradise teeming with marine wildlife. For a truly authentic Cebuano honeymoon experience, scoot off to Crimson Resort and Spa, Mactan! The perfect representation of plush yet humble, this property is definitely one to stake out. Its 250 Guest Rooms and 40 Private Villas boast a different definition of elegance combined with opulent designs. Be sure to book one of their luxurious Beach and Ocean Villas, or their exclusive Beach Casita. With only two units available, you and your partner can definitely expect VIP treatment! Treat yourself to unparalleled views of the beach from your casita, or soak your worries away in their large bathtub enclosed by emerald green foliage for the privacy that you desire. Create lifelong memories to cherish at Crimson Resort and Spa with their Destined For You honeymoon package! The folks at Crimson Resort and Spa truly know how to please newly-wed couples, packing in all the essentials that you need for that perfect romantic vacay! This amazing package, valid till 20 December 2018, includes: 3-night Villa stay, a bottle of rose wine and truffles upon arrival, daily breakfast at Saffron Cafe, afternoon cocktails for two, in-villa picnic lunch and four-course dinner, 3-hour spa treatment for two, 20% discount on non-motorized water sports and roundtrip airport transfer. Check out this great deal and indulge in the ultimate honeymoon experience! Crimson Resort and Spa also has a multitude of other room, F&B, leisure and spa promotions that you must certainly take advantage of so get browsing here! Read Tripzilla’s hotel review here and to visit Crimson Resort and Spa’s website, click here! When it comes to upscale accommodation, the name Shangri-La is usually the first that comes to mind. This brand name has been lauded worldwide for its high-end suites, exceptional services and amenities. The top drawcard of this extraordinary resort? Its very own Marine Sanctuary! Just a short walk away, encounter a diverse range of fish, corals and clams on a snorkelling tour organised by the resort itself. Exquisitely designed and thoughtfully furnished, the Shangri-La Mactan’s Ocean Wing is set amidst lush gardens with a separate compound to offer exclusivity for its guests. Each Ocean Club room comes with a balcony facing the sparkling waters of the Mactan Channel and spellbinding sunrise views! Indulge in an exclusive dwelling for your honeymoon, and save big at the same time! Enjoy a whopping 20% of savings on already irresistible rates at Shangri-La Mactan’s Ocean Club rooms and suites. What’s more, there is no minimum stay required to enjoy this promotion! This Seaside Indulgence promotion, available till 30 June 2018, includes: premium access to the Ocean Club Lounge with all-day refreshments and cocktails, daily buffet breakfast for two, access to Water Pavilion and The Spa, complimentary non-motorized water sports and roundtrip shuttle bus airport transfer. Check out this great deal and luxuriate in Shangri-La’s premium offerings! The property also has various other offers that you should explore here. 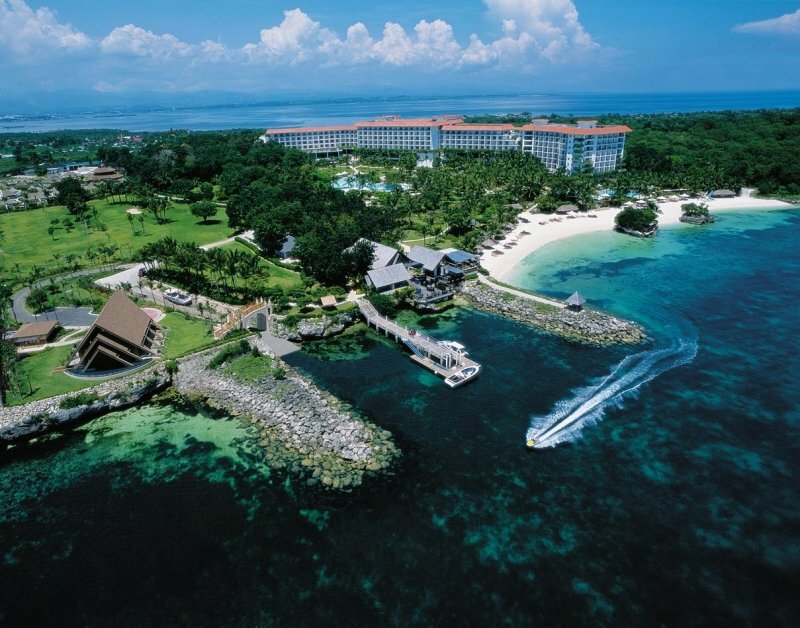 Read Tripzilla’s hotel review here and to visit Shangri-La’s Mactan Resort and Spa’s website, click here! 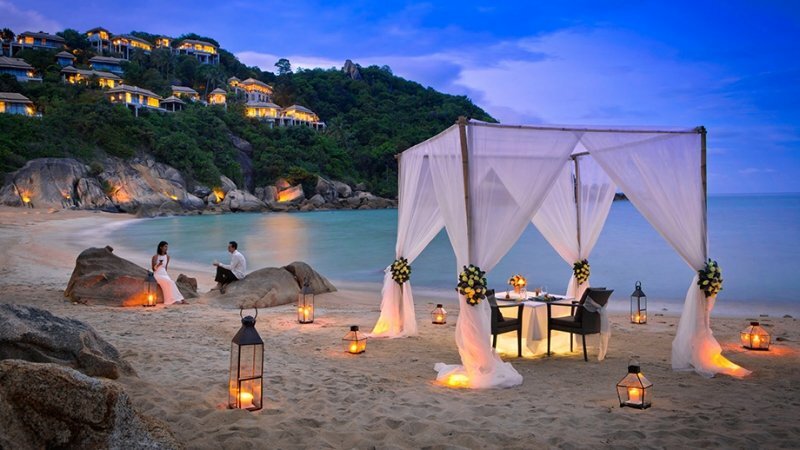 Surrounded by lush palm trees and sapphire blue waters, Koh Samui is the ideal destination for couples who love beaches! The island has all the right assets of an exceptional place to stay with your loved one. Be it sunset cruises, relaxing couples’ spa appointments or private dining experiences, you’re in for a time of romantic bliss in Samui! Paradise within paradise? The Banyan Tree Koh Samui is a standing testament to that! 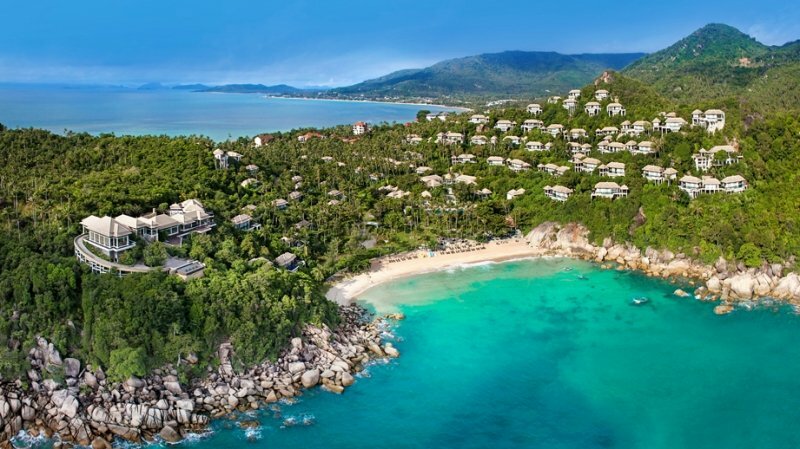 Nestled in the lush jungle of a private bay in Lamai, Banyan Tree Samui overlooks the emerald green waters of the Gulf of Thailand. Retreat into a secluded haven and enthrall yourself with the best elements of a tropical honeymoon: perfect beaches, sensuous spa escapades and divine dining experiences. Embrace love in the tropics and slip into a blissful repose in Banyan Tree Samui’s Ocean View Pool Villa. The pool villas feature a roomy infinity pool and sun-lounge for you to bask in the honeymoon mood. Wake up to the fresh sea breeze and the lullaby of nature in your exclusive abode. When you think of honeymoon destinations, Cambodia will probably not be the first country that comes to mind. Cambodia’s unexploited nature is hard to get anywhere else, and is a wonderful budget honeymoon destination that boasts stunning natural landscapes! For an out-of-the-radar honeymoon destination, Sihanoukville is the place to go! It is an up-and-coming resort destination, and several resorts here pride themselves on sustainability. Picture this scene – birdsong and gibbon calls in the background, as you slowly awaken to the face of the love of your life, before sauntering out to watch the morning mist clear over the magnificent Cardamom Mountains. 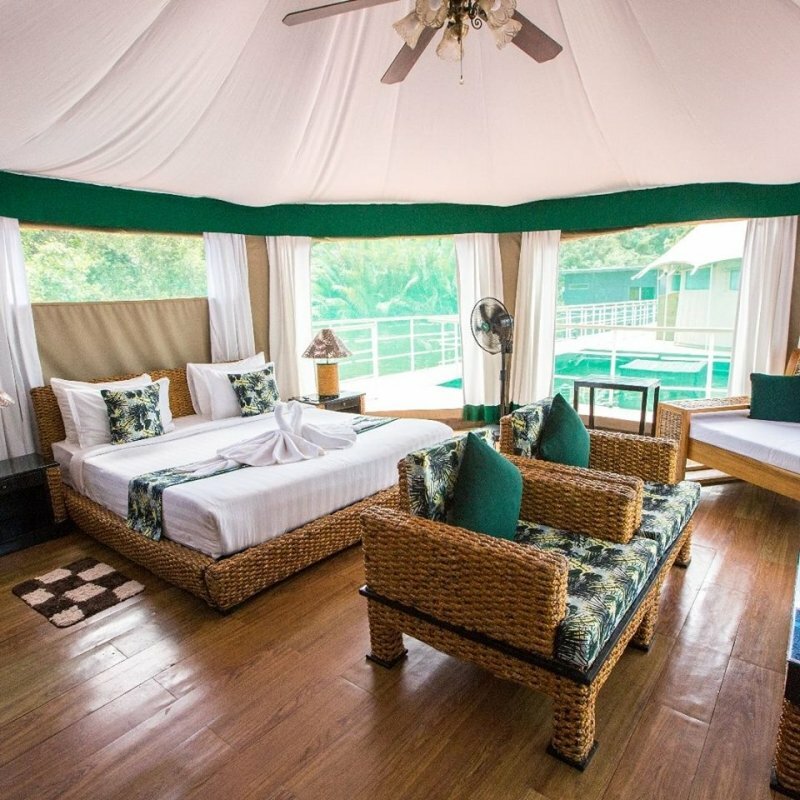 That is exactly what you can expect when you stay at Four Rivers Floating Lodge’s luxury tents in Sihanoukville. 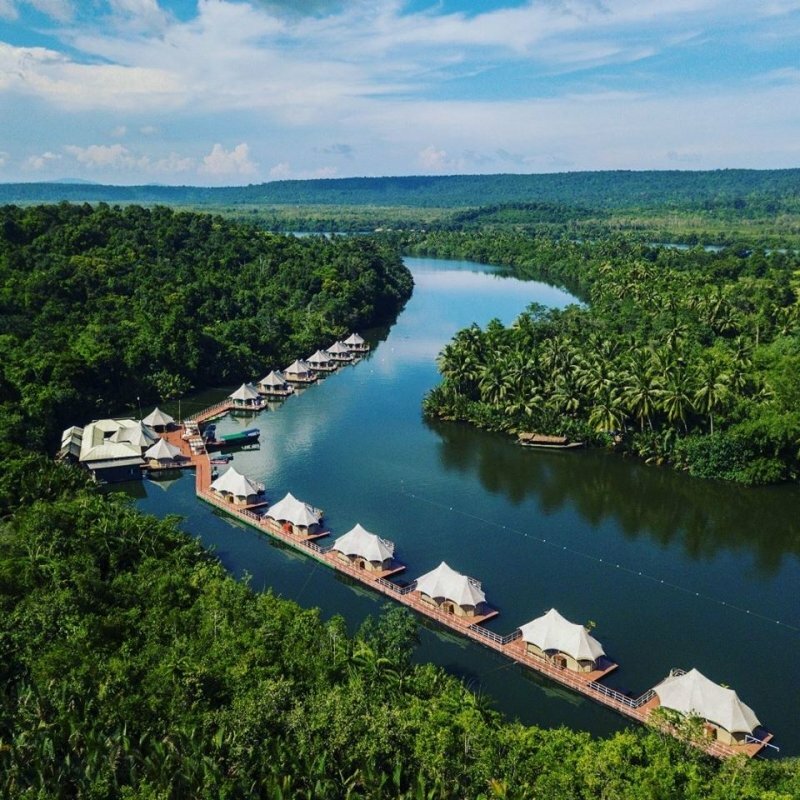 With only 12 tents of its kind bobbing on the Tatai River, it is the world’s first floating tented resort. They pride themselves as Cambodia’s most premier sustainable hotels and have a multitude of eco-friendly features. Honestly, this is the perfect amalgamation of nature and luxury. The Maldives are exorbitantly overpriced, and Seychelles is out of fashion. 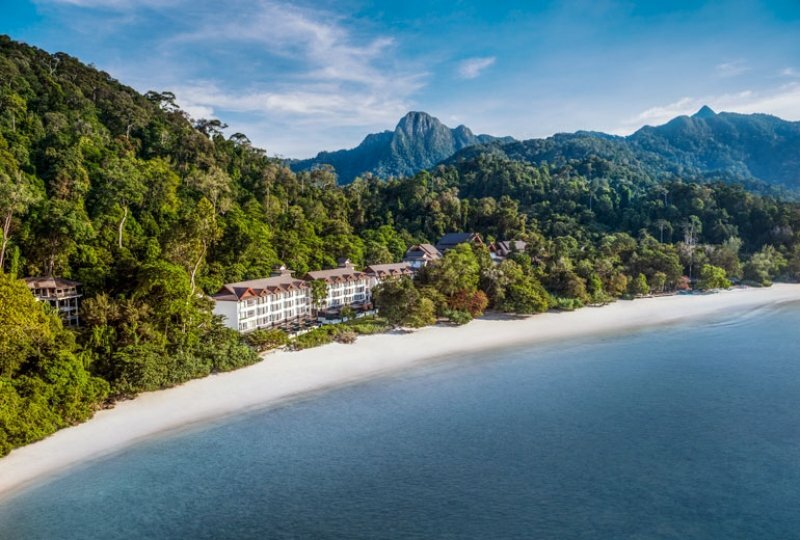 Instead, Langkawi is a better place to skedaddle off with your beloved. Truly a tropical paradise, the beaches and shorelines of Kedah’s Jewel will leave you feeling dreamy and drunk in love. Yes ladies, it’s time for you to don that cute bikini that you packed especially for this trip! On this paradise on earth, there are numerous swanky resorts, dining options and fabulous shopping places. What else does one need for an ideal honeymoon? If you’re feeling a little adventurous, bask in the rugged beauty of the island’s hot springs, parks and waterfalls. Escape to this gorgeous resort that sits against the backdrop of an ancient forest, exuding vibes of a secret castle. Truly, this is the real definition of a honeymoon escapade. 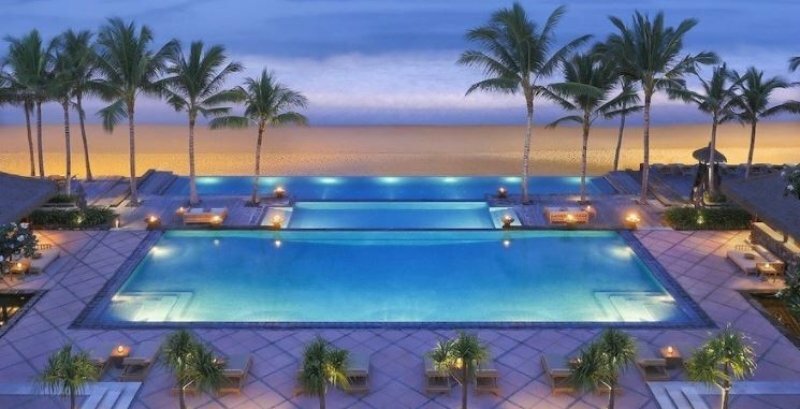 The service at this resort is said to be top-notch that it’ll make you want to stay even longer! A must-book room at The Andaman would be their swanky Jacuzzi Studio, featuring a private jacuzzi for you to kick back and relax with a glass of champagne. If you’re exhausted from your recent wedding season, the V Botanical Spa at Andaman offers a multitude of spa treatments that’ll ease your fatigue! You can even choose to have your massage at the beach or on a hill overlooking the sea! Cracking your head over where to spend your honeymoon? Look no further and enthrall yourself in a blissful spell at the Andaman Resort with their Romantic Escapes Package. Package rates start from only MYR 1209 nett per night for two in their Deluxe Rainforest room. A minimum 3-night stay is required to enjoy this special promotion! Book your room now and enjoy: daily breakfast and complimentary bottle of wine, dinner for two, morning/night guided Nature Walks, upgrade to higher category of room, based on availability, return airport transfer and discounts on couple spa treatments. Check out this great deal here and bring your honeymoon to the tropics! Have a look at Tripzilla’s review of The Andaman Resort here, and to visit their website, click here! Some of these locations are exotic, some are beachy, some are ancient and some are simply breathtaking. But one thing that all of them have in common: they promise you a great experience for your romantic honeymoon escapade! With this specially selection of hotel recommendations, you’ll be in for an exquisite trip. You might just be longing for more honeymoons after that. So run along and celebrate your well-deserved marital bliss!